Attorney General says Women of the Wall must pray in designated area and can be removed from Western Wall if they do not comply. Attorney General Avichai Mandelblit on Wednesday ordered the Women of the Western Wall to pray only in the special area designated by the police and the Western Wall Heritage Foundation. The order was given following a petition by the foundation and the police in response to disturbances which took place on Rosh Chodesh (the first day of the Jewish month) in recent months. If the Women of the Wall disobey the directive, the police have the authority to remove them from the Western Wall. Attorney Orly Erez Lachovsky, legal adviser to Women of the Wall, said in response to the instruction of the Attorney General: "The rabbi of the Western Wall is authorized to issue instructions to ensure the prohibitions set forth in the regulations of the holy places. 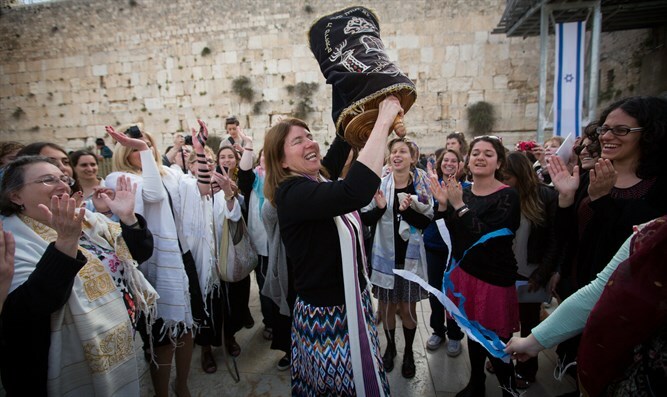 The Women of the Wall have not violated any prohibition and they have acted in light of the District Court's ruling five years ago, and therefore there is no reason to remove them from the Wall. "We are amazed by the chutzpah of the Rabbi of the Western Wall - with the backing of the Religious Affair's Ministry - who instead of distancing those who interfere with the prayers of the Women of the Wall and who have been using violence against them for two years - are trying to threaten the Women of the Wall who wish to exercise their right to pray as they do."